Shiner found his ideal two-legged friend this weekend. Reddit is good for all kinds of things, like fan theory wormholes for your favorite TV shows, subreddits devoted to any and all of your weirdest fascinations, hysterical story time sessions with celebrities, and, every once in a while, a heart-warming share that gives you such a big smile you almost forget your winter vacation is over now ... like this one. On Monday (Jan. 4), a Reddit user named kt2133 went and hit us all squarely in the feel spots when she shared the story of her brother Jordan Trent and his new pooch Shiner. Shiner was the last left of his litter because of one very unique trait: he was born with just one eye. And while some would-be buyers (the pup was even discounted) turned a blind, well you know, to the little guy, Jordan saw him as the perfect match. Why? Thanks to a long ago lawn care-related accident in his youth -- "When I was fifteen a piece of metal flew into my eye while weed eating," Trent told MTV News -- he also has no sight in his left eye. 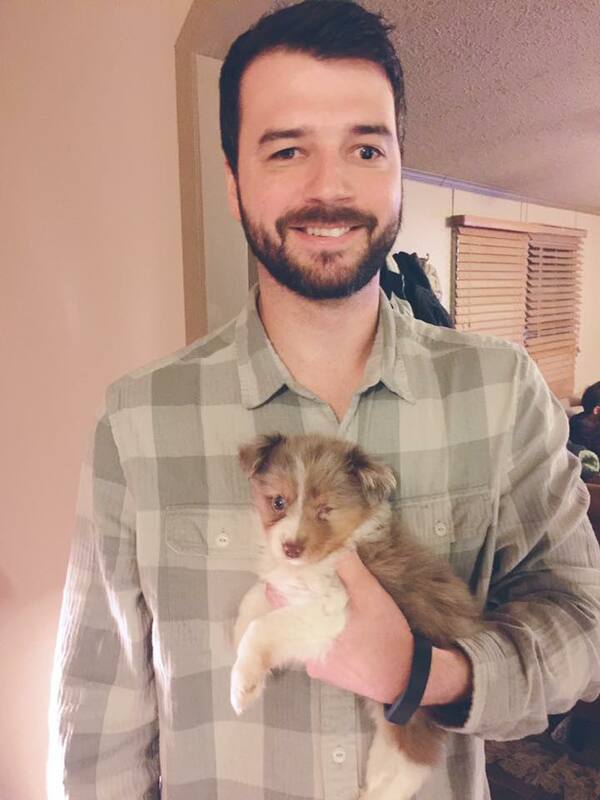 Jordan and his family -- his kiddos insisted the pooch's last name be Solo because they're mega "Star Wars" fanatics like everyone else in the galaxy -- adopted the Australian Shepherd fur baby on Saturday. "We've only had him a couple days," Jordan explained. "He is acclimating to our family great." Indeed, even though Shiner Solo(-Formerly-Bear) and Jordan have a very special commonality, the furball has definitely made picture perfect pals with the rest of the fam too. Here's lookin' at you, cutie! So glad you found the ideal fur-ever home, buddy. And also thanks for helping us start 2016 off on such a happy foot.